Malta has long been on my list of places that I wanted to visit, an archipelago situated in the central Mediterranean between Sicily and the North African coast, best known for its rich history, crystal blue waters and endless sunshine. It’s not often that I have the chance to take a mid-season holiday with a few days completely off the bike, but the opportunity arose to meet up in Malta with some of my relatives from Australia who were travelling around Europe. Let’s just say it didn’t take much to convince me. Having just finished the 10 day Giro Rosa, I was in much need of some R&R and time away from my bike. Travelling directly from Italy, I landed in Malta late in the evening after finishing my race and super excited for what awaited. My only challenge for this adventure was that my time was limited, the question I had for myself was how much could you see of the island and experience in 36 hours? With a late night flight, it was almost midnight by the time I arrived at my hotel, The Diplomat in downtown Sliema. You could feel the holiday vibe in the air with plenty of people out and about enjoying the warm summer evening. I was understandably pretty tired, but I found the energy to go for a wander along the Sliema promenade on the doorstep of my hotel, enjoy a gelati and have a little look around before making my way to bed. It wasn’t until the morning when I got a true sense of the beauty of this place. In Sliema the entire length of the Mediterranean sea front is rocky, the contrast between the rock and the crystal blue water was magical. I glanced down from the promenade as I awaited to meet up with my relatives onto the long and wide stretches of flat rock, littered with blue beach umbrellas and chairs awaiting the daily sunbathers, it was very inviting. My relatives were staying with friends here in Malta so it was great, we had local guides to show us the best parts of the island. They picked me up at around 10am and we made our way by car up to the northern tip of the Island to Little Armier Bay, facing the smaller islands of Comino & Gozo. We parked up for a few hours at the small beach club of Ray’s Lido, despite having a nice sandy beach on this part of the island, it was still very European in that you rent a day bed complete with beach umbrella to lounge on for either a half or full day. As opposed to the Australian style of laying your beach towel out on the sand. It was a great spot that felt less touristy than other parts of the Island. The water was crystal clear and a pleasant temperature to float around in when you weren’t relaxing on the shore. If you’re not the one to laze around all day and want to be active, there were plenty of options to hire equipment for water activities including paddle boards, jet skis, paragliding, etc. We hired kayaks for an hour, a perfect little core session and the chance to explore some of the hidden coves away from the beach. When it came to lunchtime we opted for a beach picnic, bringing along our own food for the little adventure but the beach club also has it’s own restaurant and bar if you’re feeling peckish whilst you’re there. After the beach we headed back to Sliema mid-afternoon to recharge our batteries for a short while before the evening adventure. We all met up again late afternoon and took a 20 minute bus ride around the harbour to Valletta, the capital of Malta which also stands as a world heritage site. It owes its existence to the Knights of St John, who planned the city as a refuge to care for injured soldiers and pilgrims during the Crusades in the 16th century. As you entered the walls of Valletta you could feel the history and culture of the city, filled with baroque architecture and buzzing with atmosphere. It was a beautiful town to walk around, we began in the Upper Barrakka Gardens where you find an amazing panoramic view of the Grand Harbour and the medieval three cities across the water. Up here you can really get a sense of how much work must’ve gone in to build such a fort and the late afternoon sun made for the perfect light to take some happy snaps. We continued to walk around the walls and then up into the centre to one of the piazza’s for an afternoon refreshment and some quality people watching. I must say though it isn’t the easiest town to walk around, with its multitude of stairs and steep, undulating roads, reminding me of the streets of San Francisco. As the sun was beginning to set it was time to head to dinner, we had a reservation down on the water at a restaurant called Cockney’s. The name may throw you but don’t get put off as it was a fabulous seafood restaurant with stunning views across the water and a perfect spot to watch the sun go down as you enjoy your meal. 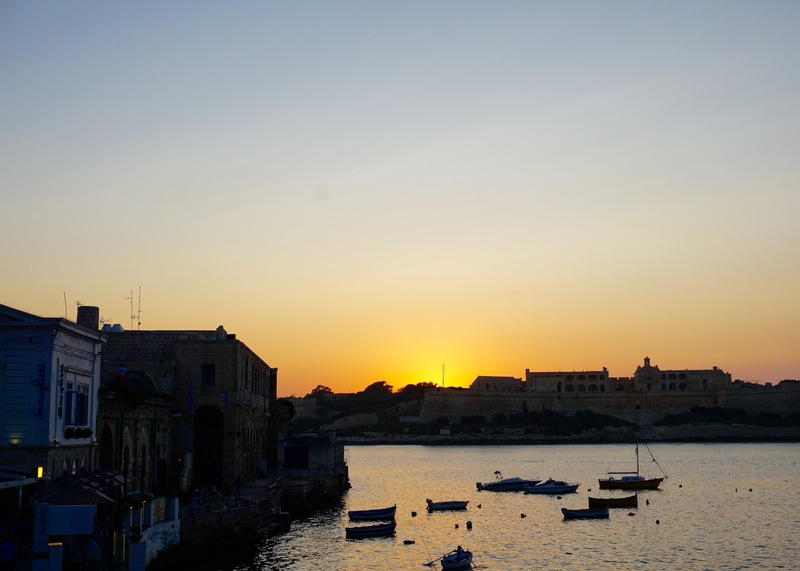 After a fabulous feast, it was just a hop, skip and a jump to take the 10 minute ferry ride back across the harbour to Sliema and time to call it a night. The next morning I was left to my own devices for my final hours in Malta as my relatives flew out early in the morning. Food is one of my favourite things in life with breakfast being my favourite meal of the day. I decided to skip the hotel breakfast and look for a cafe in Sliema. I came across this great cafe set up by New Zealander’s just around the corner from where I was staying, aptly named ‘Mint‘. It was a mint cafe that’s for sure. The concept behind Mint cafe is to bring the people of Malta a Kiwi style cafe which is similar to what we have in Australia. Fresh food made from local produce served in a relaxed atmosphere complete with a great coffee menu, fresh juices and smoothies along with some treats if you’re looking for something sweet. After fuelling up I went for a little wander around the centre of Sliema to have a brief look at the shops. There were a couple of nice little boutiques I came across but for the most part I wouldn’t come to Malta for the shopping. With limited time left, I spent the last part of my trip soaking up the sunshine and the sea. I soaked in the water and relaxed in one of the natural rock pools carved into the rocky beach outside my hotel. It was the perfect way to end my 36 hours in Malta. It was a great trip and I place that I would highly recommend visiting if you’re looking for a summer beach get away. I’m sure there is so much more to discover of the island and I look forward to returning again in the future.